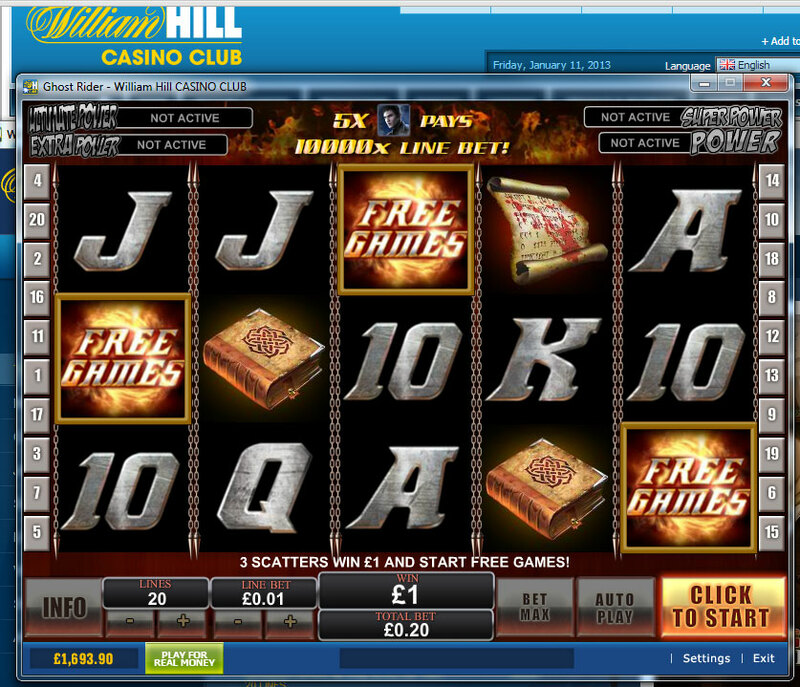 The William Hill online casino breathes quality and professionalism. 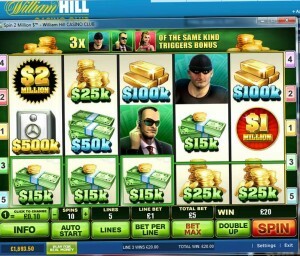 William Hill is one of the largest gaming and gambling company’s around and there is good reason for its success. 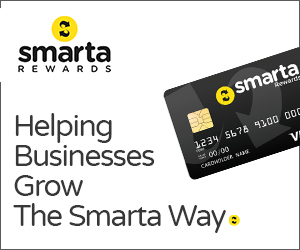 It operates in UK, Ireland, Bulgaria and Israel. 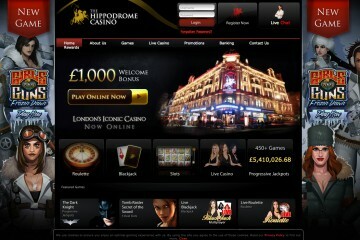 It employs over 15,000 people with over 2,000 high street shops and has a huge telephone betting business. William Hill came into being in 1934 and became a publicly traded company (has been traded on the London Stock Exchange) since 2002. 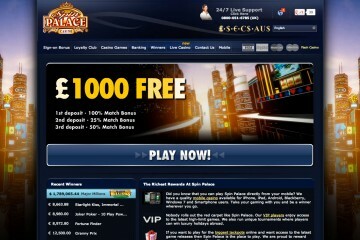 William Hill extended its gambling experience to online users in October 2008, providing the same quality that is often synonymous with the words William Hill. 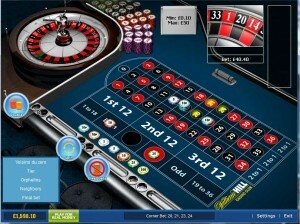 The online casino has a large variety of games, the site is easy to use and navigate and there are a good number of promotions and bonuses. The William Hill online casino offers users over 100 different games including arcade games, video poker, roulette, blackjack, slots and constant additions of either new games or classic games whose graphics and/or gameplay have been upgraded. All games have to be downloaded individually and some can take a few minutes. However once downloaded, they do not need to be re-downloaded at any point. 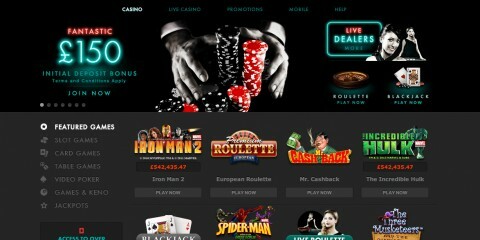 The Playtech platform also allows users to save their favourite games into a list on the casino pop-up screen homepage. 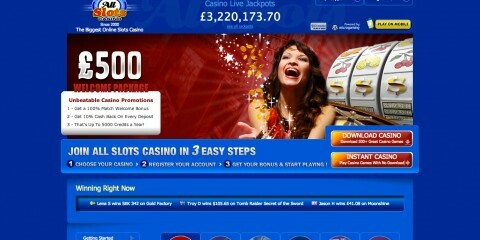 The William Hill casino club website layout is very professional looking and instantly recognisable. Clearly laid out links and sidebars help the user navigate the page quickly and efficiently. 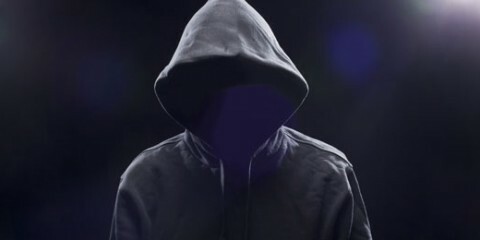 There are no bright flashing lights which can make a casino site look cheap and information and help on the website is clear as well as extensive. Transactions are secured by Thawte and there are over 50 different ways to deposit money with varying deposit bonuses for each. Deposits are instant and currencies accepted and further information is clearly shown in a table in the ‘deposit’ section. Additionally the ‘cashout’ section of the site is just as user friendly with a table showing the length of time expected for each withdrawal method. Frequently asked questions and further important information is displayed clearly below the table. 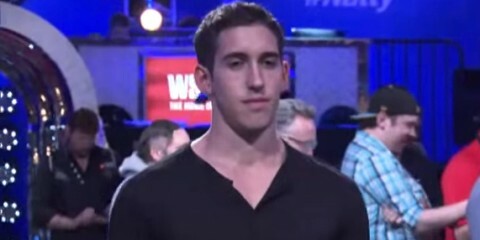 There are currently 13 different ways to withdraw user’s winnings. 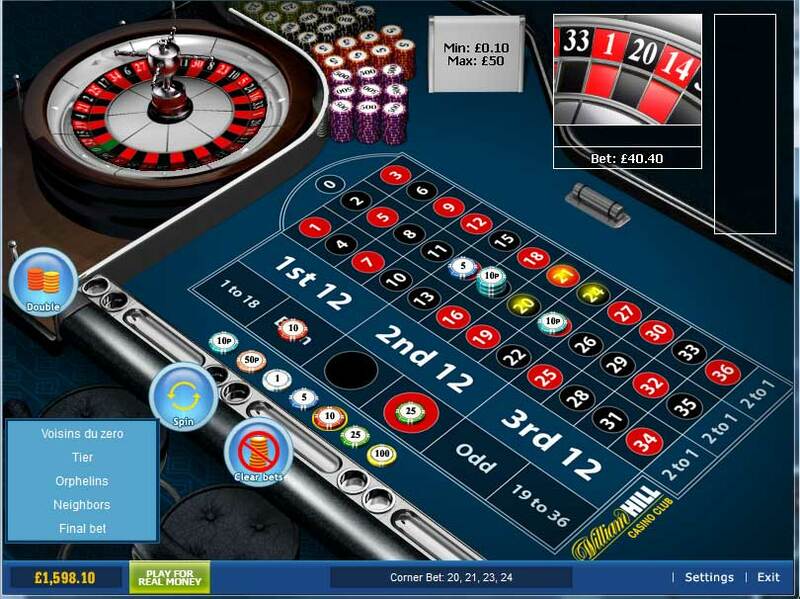 In partnership with software giants Playtech, the online casino (which is actually called the casino club so as not to clash with William Hill’s own casino section) is quick to download and simple to install. On a personal level I prefer the games produced by Microgaming rather than Playtech. Games from the former of these two company’s have better graphics and betting options are less complicated. However Playtech games are still top notch, with some very fun and ingenious classic game variations. 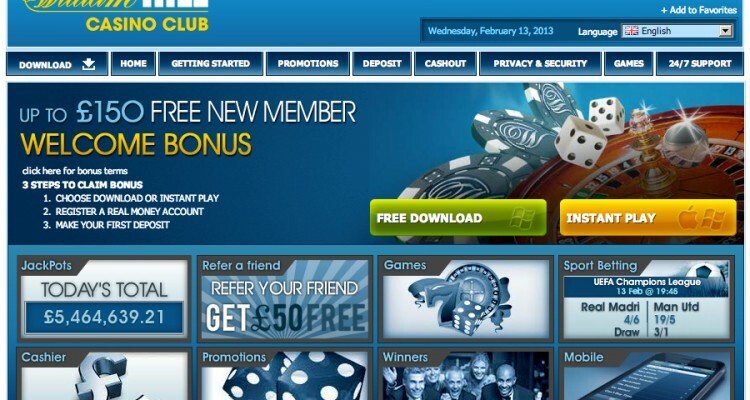 William Hill casino club has six promotional offers on at the time of writing. 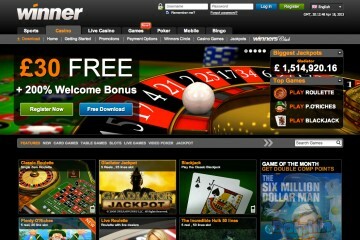 There is a new user bonus of up to 150 percent, giving the user up to £150 free. 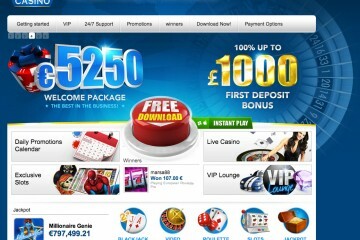 In addition to this there is a 60 percent (up to £500) second deposit bonus. There is a 20 percent (up to £100) monthly bonus every month for one year, a 10-15 percent bonus on any deposit (amount depending on deposit method), a £50 bonus for any friend referred and a points for cash system every time you wager £10 at the casino. 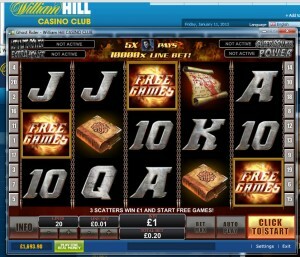 The William Hill online casino, like most others, has a 24/7 online chat service. They can also be contacted via email, phone and fax and staff are helpful and knowledgeable.